This set contains 6 acrylic paints specifically designed to create rust and metallic chipping of all kinds. The set includes matte paints for different shades of rust and a satin color for old chips on worn metal. Additionally, these paints can be applied with either a brush or an airbrush offering complete flexibility. 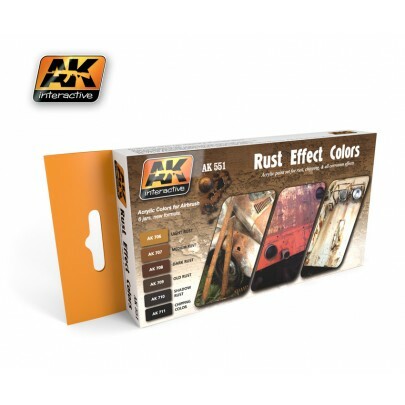 Contains: AK-706 Light Rust, Ak-707 Medium Rust, AK-708 Dark Rust, AK-709 Old Rust, AK-710 Shadow Rust and AK-711 Chipping Color. Rust Effect Colors This set contains 6 acrylic paints specifically designed to create rust and metallic chipping of all kinds. The set includes matte paints for different shades of rust and a satin color for old chips on worn metal. Additionally, these paints can be applied with either a brush or an airbrush offering complete flexibility. 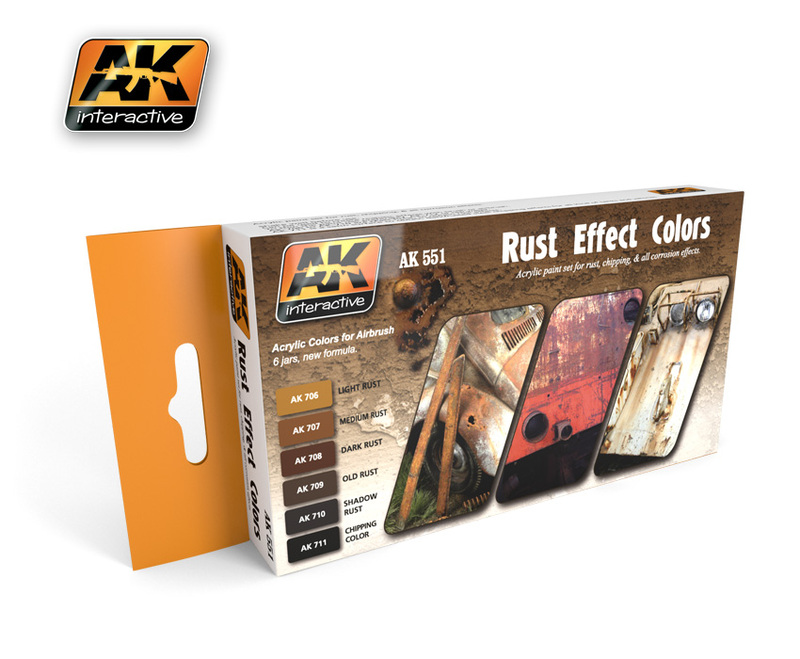 Contains: AK-706 Light Rust, Ak-707 Medium Rust, AK-708 Dark Rust, AK-709 Old Rust, AK-710 Shadow Rust and AK-711 Chipping Color.